Water Polo and competitive swimming are sports that can cause a high amount of stress on the body. If you play water polo or are a competitive swimmer, then you understand very well how the body can react to repetitive motions and overuse. Water Polo players and competitive swimmers may experience similar injuries based on the body parts used during competition. For instance, shoulder injuries, neck injuries, and upper and low back injuries are all common in these two sports. However, the most common injuries among water polo players and swimmers are shoulder injuries such as swimmer’s shoulder, internal and external shoulder impingement, dislocated shoulder, thrower’s elbow, rotator cuff tears, and rotator cuff syndrome. 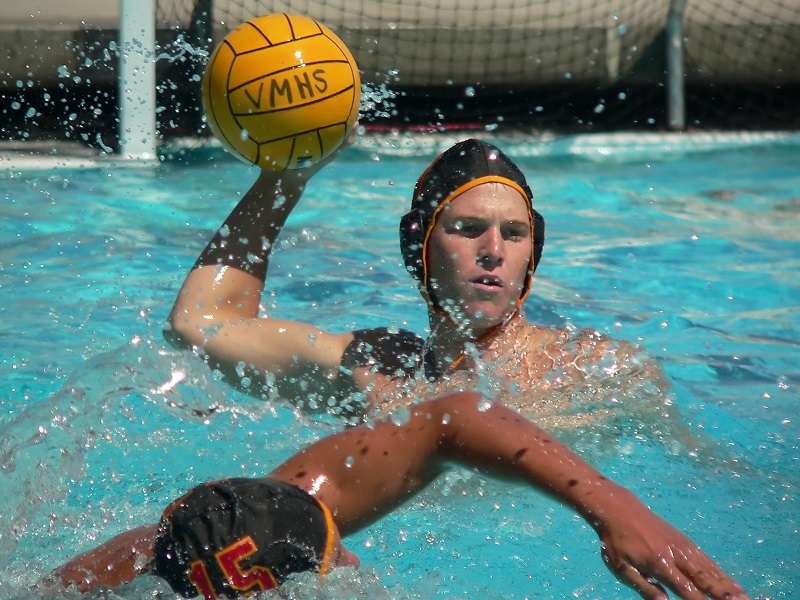 In Water Polo, the actions that are most strenuous are throwing and catching. A Water Polo player can produce sudden bursts of energy to capture a ball or gain position. The player will urgently swim to a location, grab or catch the ball, and burst out of the water to rifle the ball across the pool with one arm. Although this is a spectacular act to witness, there is a great amount of stress that happens inside of the player’s body, particularly, the shoulder of the throwing arm. Trauma from swimming and throwing the ball can lead to impingements, tears, instability, and severe pain (swimmingworldmagazine.com, Franić et al., 2014). Competitive swimmers may endure similar trauma to their shoulders based on how arm rotations can be strenuous on the body. Injury rates for swimmers was published in a global swimmers’ magazine called, SwimSwam, stating that “38% of swimmers reported missing training at one point or another due to shoulder injury” (swimswam.com, Walker et al., 2001). In fact, shoulder injuries are the most common injuries among competitive swimmers just as they are for Water Polo players. Most shoulder problems involve the soft tissues—muscles, ligaments, and tendons—rather than bones. If you have suffered a shoulder injury from playing Water Polo or from swimming, depending on your condition, a chiropractor may be able to help you recover from your injury. Call your local chiropractor to schedule an appointment today. Chiropractic care is commonly known for treating injuries or conditions related to the spine. However, most chiropractors receive training that can help them treat injuries to related areas such as the knees and shoulders. Because the shoulders are the most mobile joints in the body and the keys to a swimmer’s success, shoulder injuries are often related to joint irritation or tissue irritation, and these injuries may often be relieved from pain with a simple adjustment among other treatments. The shoulders are surrounded by nerves, tendons, and other tissues that may all contribute to the pain being produced from the injury. All of these nerves and tissues originate in the back and attach to various parts of the shoulders. The biggest culprit in shoulder injuries is repetitive motion, which, for swimmers and Water Polo players, is impossible to avoid. The repetitive motion in the shoulders can often cause muscle spasms, inflammation, nerve impingement, and pain. However, through a chiropractic adjustment to the shoulder, depending on your condition, the nerves become free to communicate with the tissues, which allows the shoulder anatomy to benefit from the adjusting motion. A chiropractor will also give attention to the neck and upper back, as they also contribute to the function of the shoulder and can work to relieve pain. Additionally, icing a shoulder may help reduce inflammation and sufficient rest can also help the shoulder recover. Keep in mind that chiropractic care may not help everybody with a shoulder injury. Each person responds to chiropractic care differently, and we all endure pain in our own way. The best way to determine if chiropractic care will work for you is to schedule a consultation to discuss your injury with a chiropractor and allow him or her to closely examine your x-rays or MRI images. If you have suffered a shoulder injury from playing Water Polo or from swimming, depending on your condition, a chiropractor may be able to help you recover from your injury. Call your local chiropractor to schedule an appointment today. Patrick Loera is a Staff Writer and Content Creator for Chiropracticcare.today and other medical blogs and websites. Although he is a Washington state native, he graduated from San Jose State University in California with a Bachelor of Arts in English with a concentration in Professional and Technical Writing. Patrick considers himself a middle-aged athlete, and he has experienced the benefits of chiropractic care firsthand. He currently works with several medical professionals—DCs, RNs, MDs, and college professors—to produce chiropractic content that can help people understand how to keep their body healthy, how injuries can be treated through chiropractic care, and what to expect from a chiropractor. Patrick spends his spare time playing basketball or relaxing on the beach reading a good memoir or mystery novel.